Two-Day Swim Camp: Sign up for one or SAVE by signing up for both sessions! There are two ways to swim faster in each stroke: increasing stroke length and increasing tempo. Maximizing both of these components is vital to your swimmer being able to reach their potential in every race. However, many swimmers shorten their strokes when they increase their tempo OR they slow down their tempo when they increase their length. 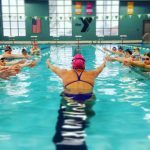 At this swim camp there will be four sessions, two for each age group, all working on maximizing stroke length while also achieving a faster tempo in each stroke. On Saturday participants will work on freestyle and backstroke. Then on Sunday, participants will work on butterfly and breaststroke. Sign up for one or SAVE by signing up for both sessions for your swimmer’s age group! Swimmers and parents are invited to ask Felicia and Staciana questions during a Q&A session. Gain insight into their training regimen, diet and nutrition, and recovery tactics. Observe Felicia and Staciana swim at full speed and demonstrate a progression of perfectly executed drills to achieve powerful, efficient and fast swimming. 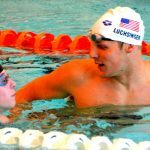 Swimmers will get to practice what they've learned by taking their stroke to your top speed with two of the best swimmers in the world! They'll work on holding onto their form while challenging themselves.